These 100% cotton multipurpose towels are low-lint and easily laundered. The towels measure 14” x 24”. 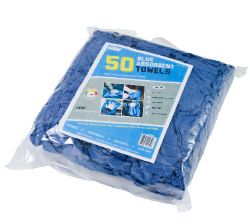 Blue absorbent towels are displayed in a tearaway display carton for ease-of-access.